The rainbow warrior is definitely a pattern that deserves space in everyone’s box. Lance Egan, of team fly fishing USA and who has won pretty much every fly fishing competition around, came up with this great pattern. If he’s fishing it then you know it’s legit. The rainbow warrior works well for any trout species you are targeting and I’ve had great success with it in pretty much every condition I’ve fished it in. 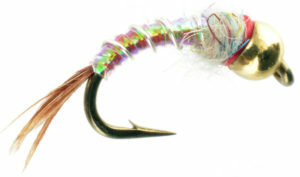 The rainbow warrior does its damage on the bottom like any other midge pattern. Most people tie them with a tungsten bead to keep them deep. Although, I have also had success with it as a dropper off of dry flies in the summer months. It’s just an all around trout catcher. It does not imitate any particular bug but seems to do better when I’m finding midge or pupa under rocks. I also really like fishing it in tail waters where scuds and cress bugs are in abundance. It is an easy pattern to tie and there are plenty of great tutorials out there. I particularly like what Tim Flagler of Tightline Productions has to offer for the rainbow warrior, and for most new patterns I want to try. Check his video out at https://www.youtube.com/watch?v=QFwXkQ0jRJo. So if you don’t have any in your box, then go tie some up and you and the trout will be very impressed.